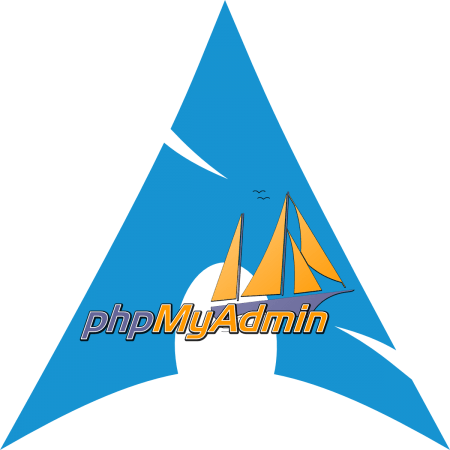 phpMyAdmin is a PHP based database administration tool. It allows database management via the GUI web interface as well as executing SQL queries manually. It is a great addition to a LAMP or LEMP server stack. Before proceeding install Apache web server, install PHP and install MySQL / MariaDB database. Install the packages with pacman. Verify that extension=mysqli.so and extension=mcrypt.so lines are uncommented. Optionally also uncomment extension=bz2.so and extension=zip.so lines to enable compression support. PHP also needs access to /etc/webapps directory, verify that the directory is present in open_basedir option. Create the configuration file for Apache. Copy the configuration options and save the file. Add the line Include conf/extra/phpmyadmin.conf to the file. This will add the configuration file options to Apache configuration. Restart Apache Server for he changes to take effect. You may see The configuration file now needs a secret passphrase (blowfish_secret). error message at the bottom in which case you can add the passphrase in the configuration file. Specify the blowfish passphrase with $cfg['blowfish_secret'] variable. The passphrase is a random string of characters for example 6k$L29-2GyxmFr89HLj-vnpqjw}nO-]7]4$WL7h). Access the web interface in the browser on the current IP address. For example http://192.168.0.100/phpmyadmin/. Log in with the username and password created in MySQL / MariaDB setup. By default the username is root with no password.